Over the next few days I will be profiling a handful of gadgets and tech gifts. Some will be a part of a general gift guide and others will include giveaways. They are all items that I have used (the giveaways will be brand new, just for the winners of course) and that I find useful. I love my smartphone and all of the useful apps that I talk about when I get invited to join Dotto Tech‘s radio show however at this time of year the battery just drains at an expedited pace. Being on the go, checking email, taking photos of festive sights, running apps for shopping, parking, and productivity all mean that my battery isn’t going to last very long after it charges overnight. Fortunately the Belkin Grip Power Battery Case can keep you going, doubling battery life by providing a full, additional charge on the go. The Grip Power Battery Case’s rechargeable 2000 mAh battery capacity means you can talk, text and browse the web twice as long on one charge than with your phone alone. It’s easy to use — just press and hold the power switch to turn the battery power on and off, and press it once to see the battery’s status. I have been using a similar battery case from another manufacturer and two things it does not have, that the Belkin does, is headphone compatibility and the shock-resistant bumper with secure-hold grip. A Micro-USB charging cable: just plug the cable into the side of your case, and in one charging session, you’ll have full iPhone power and backup power whenever you need it. Putting on the Grip Power Battery Case takes just two simple steps: First, slide your iPhone 5 into the battery pack and connect it to the built-in Lightning connector. Then, snap on the outer shock-resistant bumper. In seconds, you’re fully powered, fully protected, and ready to go. The Anti-Glare Camera Ring doesn’t get in the way of your camera flash, so you can keep on snapping great pictures. I will draw one winner at random from all entries at 12:00pm on Tuesday, December 17, 2013. Follow Belkin on Twitter and Facebook for more gadget gift ideas. 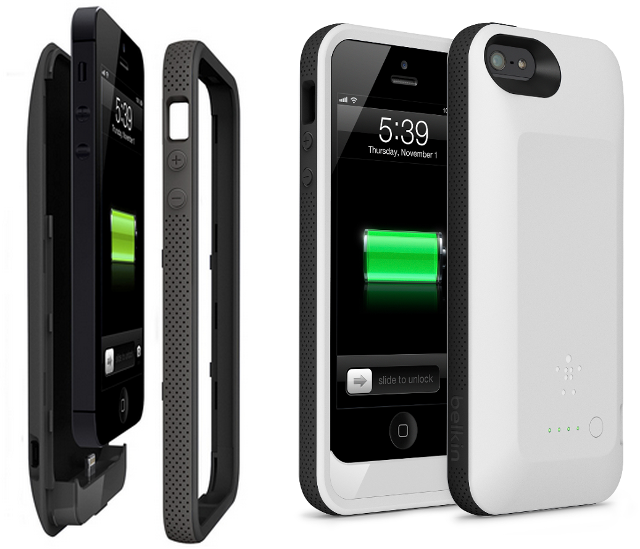 The Belkin Grip Power Battery Case is for the iPhone 5 and iPhone 5s only and the prize is the white model. Update The winner is Emilia! “Lose it” for sure as it helped me loose 40 lbs! Duolingo. Something useful in my free time: Learn a new language or brush up on rusty second languages. My favourite app is Vine! Favourite app remains and will probably always be Google Maps. Fav App has to be Twitter, you can get so much info in the most timely manner. I’m with the person who likes Google Maps – works for me! Yeah I’m not gonna lie, Candy Crush Sage. I like Pay by Phone – so convenient! Pay by phone for Vancouver parking is handy. They need to come up with charging stations around the city. Candy Crush. Thank you Miss604! Candy Crush is my favorite! This would be wonderful for traveling. amazing!! what a great idea! pick me please! Songza! Keeps me going during the day! My favorite app is Shazam. You hear a song playing and don’t know the artist/song/words? Use this app and it will tell you everything about that song when it hears it.